Why has Jacinda's Twitter account gone silent? 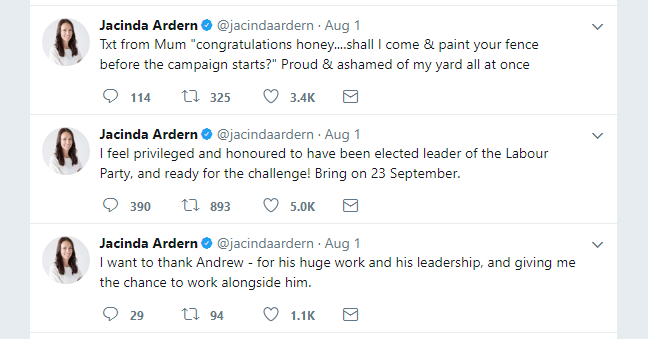 Russell Brown noticed this week that Jacinda Ardern hasn't tweeted since 20 August. It's struck me as a little odd as it's not that much effort to take a Facebook post and turn it into a tweet. While I did jokingly ask Labour whether they'd lost her Twitter password, it turns out that she was never that particularly active on Twitter anyway. Looking back at August she tweeted a grand total of 11 times. Over that same time frame Bill English has tweeted 110 times! It strikes me as a bit bizarre. Generally speaking the demographics of Twitter suggest its audience is hugely receptive to her content. Judging by the response her three tweets received when she became Labour Party leader, it's really surprising that they haven't done more here, especially with more than 82,000 followers. That's a lot of potential amplification for your content from a very sympathetic audience. They're wanting to leave Jacinda's Twitter account as something she runs herself. The fascination with President Trump's personal use of Twitter does suggest that leaving a leader to use their own Twitter account as they see fit could be an effective way to get your message out, especially if it's devoid of Trump's craziness. The problem is you probably need your leader to use Twitter for it to be effective. Labour is consciously trying to get journalists and bloggers to go to Facebook to see what Jacinda's doing, and to embed that Facebook content onto their websites directly rather than from Twitter. This approach does have its merits, as Facebook is a far superior platform to reach voters with, while journalists and influencers generally use Twitter to keep up with events. If you force them to embed your Facebook content into their stories so by directing your content solely to Facebook they'll be forced to support how that channel performs. Labour might be trying to avoid adding to Jacinda's public profile given the near blanket coverage she's received since becoming leader, and thus avoid Jacinda-fatigue. Though given how prominently she features on all their campaign collateral this seems unlikely. Tying back into my first idea, as a result of campaigning, Jacinda hasn't had time to tweet that often. Though I did see one journalist make the point (and I wish I could find the story or tweet I saw it in) that Jacinda has only had one or two carefully choreographed events in front of large Labour Party faithful crowds each day for the past week, presumably as she swatted up ahead of the debate and to avoid any awkward optics that might suggest that the Jacinda effect is tapering off. A look through her Facebook feed seems to confirm this rather quiet campaigning approach leading up to the debate. Labour realised most of Twitter's active users are already either voting for them or the Greens and have decided to invest their efforts in Facebook where they can try to reach soft-National and NZ First voters, as well as undecided voters, to persuade them to come back to the fold. That final point is the one that I think is most likely here. There's probably elements of the other possibilities lurking around, but I think the main driver will be that Labour know Twitter is overwhelmingly going to vote for a centre-left government, so they're investing their resources elsewhere. But I can't think for the life of me the last time a leader who wants to be the head of government has effectively switched off one of their social media channels in one such a tightly contested election.